Just in case you missed hearing about it. Next Friday May 6th at the store. The show we've all been waiting for. 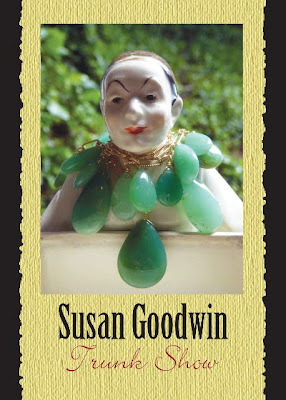 And since a certain unnamed famous musician was just in the store yesterday buying up all kinds of Susan Goodwin jewelry, the trunk show will be a great time for us to replenish our stock as well. You have just made me laugh so loudly with your little comment !! I love everything I bought at your gorgeous store and I will wear every piece with a smile on my face...Thank you for having a little haven filled with beautiful objects! See you next time I perform in Eugene!